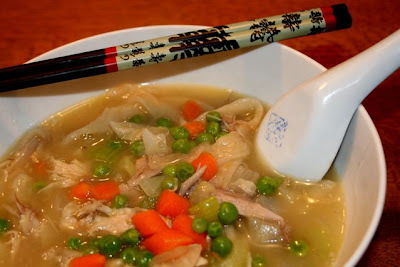 On a cold November day after Thanksgiving, nothing is better than a warm hearty bowl of turkey noodle soup. The roasted turkey carcass was converted into nectar of the gods and the noodles were homemade. Thick, rich and creamy, this was the perfect thing to warm the soul. Not much too it, really. I cooked all the leftover turkey bones and carcass with carrots, celery and onions to make the broth. Strained it off. Peeled whatever meat was left on the bones off and cooked it all together with more fresh vegetables and noodles.